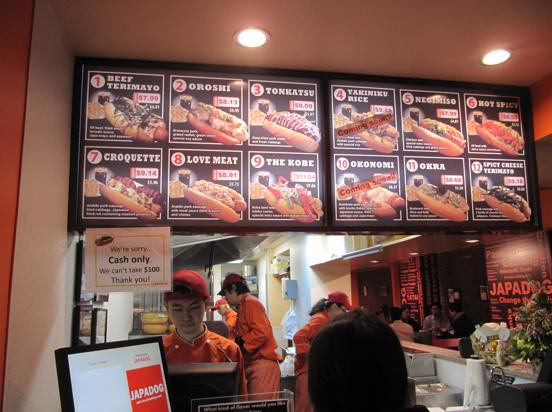 Japadog is here. Canada's contribution to fusion food has finally made its American debut, strategically located directly across the street from my favorite pub on St. Marks. I really don't think it could have been planned any better to fit into my life; I can now leave Bull McCabe's after a few pints of Strongbow and saunter a minimal distance to Asian hotdog heaven. Emily and I did just that around 9:45 pm last Thursday and the maiden expedition went quite well. 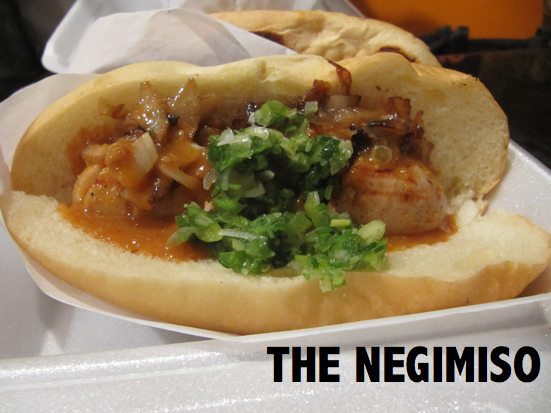 We split the Negimiso and Love Meat dogs and an order of curry fries. We tried the Love Meat first. The Arabiki smoked pork hot dog had the perfect snap to it but was not as coarsely ground as I expected. Still it was juicy, salty and delicious smothered in cheese bound ground beef and pork sauce. This is ultimate drunk food. It is as naughty as it sounds. Emily cited bolognese flavors while I just reveled in the melted cheese. The bun was fresh and in good proportion with the thick dog. The Negimiso had more of an Asian flare. A thick chicken sausage was topped with miso sauce, fried cabbage and green onions. 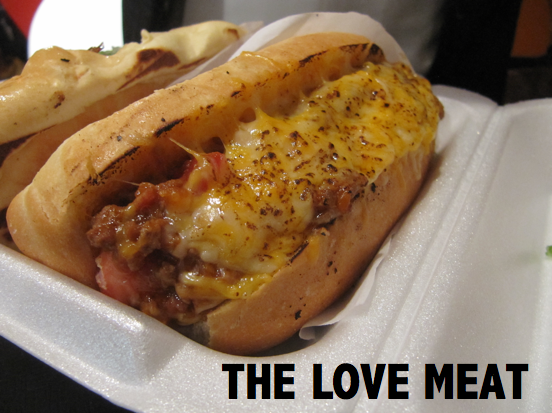 It was a lighter choice than the love meat in all ways -- toppings and sausage size. In the photo above you can see that the sausage is much smaller than the bun, creating a bite of pure bun on each side. The link was missing that nice snap to the casing but was a nice alternative to red meat. The toppings were plentiful and the combo was sweet and fresh tasting. Some reasonably spicy wasabi mayo was a nice addition. The curry fries were sweet and tasty but the fries themselves were thin and kind of wimpy. I was looking for thicker fries or a larger portion of the thinner ones. They were seasoned well though and were delicious with the wasabi mayo. Look at all those celebs! 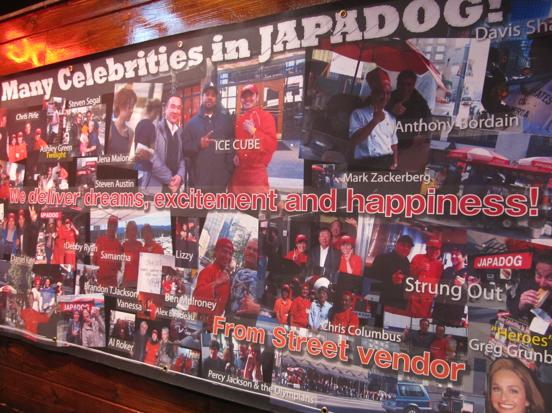 I can confirm that Japadog delivers dreams, excitement, happiness AND broken English but leaves just a little room for improvement. They were closed at 10pm which really doesn't work on St. Marks, and many curious people got shut out as we were eating our dogs. I hope to see more variations come to the New York location in the future, including the Ebichiki with shrimp sausage or the Yakisoba covered in noodles. There are a lot of great things going on here and I'll definitely have trouble resisting when I'm in the area. They are "making the world happy and alive through hot dogs!"